It might be one your favourite times of the year, but Halloween can be downright scary for your pets. The holiday is full of Halloween hazards for your dog or cat, and Kanetix.ca wants to help you keep your pets safe with these simple tips. The abundance of chocolate and candy may be heaven for your kids, but it can be dangerous for your pets. Make sure trick-or-treat stashes are stored out of their reach and remind the kids that feeding their loot to the pets can be harmful. Watch for candy wrappers too as dogs and cats have a tendency to eat these potentially dangerous objects if left around. Candlelit jack-o'-lanterns can burn your pet or cause a fire if knocked over, while props can be a choking hazard. Keep decorations out of paws reach and preferably not on the floor or ground. Generally, it's suggested that it is best to keep dogs or cats in a separate room while trick-or-treaters are coming to your door. Not only will this reduce the risk of your pet getting 'spooked' by the little ghosts and ghouls coming to the door, but it'll also cut down on any risk of your dog or cat escaping. It can be wild out there on Halloween and with lots of people and noise on the street, your outdoor cat may be frightened away from home and get lost. 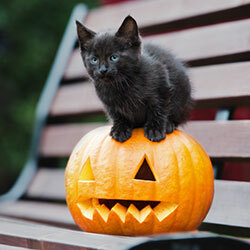 Worse yet, black cats are often targets of abuse on Halloween. Better keep your feline friends indoors for the night. If you're going to dress up your pet, make sure the costume doesn't constrict your pet's ability to see, breathe, or move. Also, make sure the material doesn't irritate them and remember to heed your pet's body language. Many pets don't mind being dressed up in a Halloween costume, but if they do, their body language will tell you. Remove the costume if your pet shows signs of distress like excessive panting, pacing, clawing at the costume, or refusal to move. Taking your dog out while you and the kids go trick-or-treating sounds like fun, but the added stress of more people and noise than usual may cause your pet to act out. If you do take them with you, keep your dog on a short leash and keep the walk short. If you do take your dog with you while trick-or-treating, make sure he or she has a tag with your contact details on it. Parts of your own Halloween costume, like fake noses, small make-up tubes or plastic accessories may be hazardous to your dog or cat. Make sure these items are stored away safely before and after Halloween. Just because Halloween celebrates scary things doesn't mean you want any scares of your own with a trip to the vet. With a few precautions you can ensure everyone, incuding your pets, has a frightfully fun time.